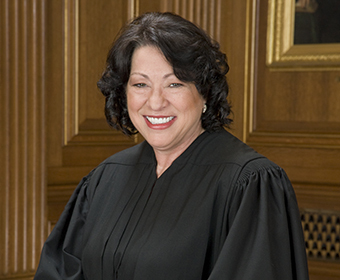 Justice Sonia Sotomayor will give a talk at UTSA on Thursday, Jan. 25. (Jan. 22, 2018) -- Sonia Sotomayor, Associate Justice of the Supreme Court of the United States and the first Latina to sit on the high bench, will give a talk at UTSA on Thursday, Jan. 25 from 10 to 11 a.m. in the UTSA Student Union Retama Auditorium (UC 2.02.02) on the UTSA Main Campus. During her appearance, Justice Sotomayor will engage with UTSA students to answer questions regarding her personal journey – rising through the ranks of the judiciary system to the nation’s highest court. “We are incredibly honored to host Justice Sotomayor on our campus,” said UTSA President Taylor Eighmy. “One of my strategic goals is to bring the world’s greatest minds to UTSA for the benefit of our entire community. As a first-generation college student herself, her appearance is an exceptional opportunity for our students to learn from someone who is helping shape the future arc of our country from her seat on the highest court in the land." Justice Sotomayor was born in Bronx, New York to Puerto Rican-born parents. Her father died when she was nine years old and her mother, Celina, worked hard to raise her children as a single parent, always stressing the value of education. A first-generation college student, Justice Sotomayor earned her B.A. in 1976 from Princeton University and her J.D. from Yale Law School in 1979 where she served as an editor of the Yale Law Journal. From 1979 to 1984, Justice Sotomayor was an assistant district attorney in the New York County District Attorney's Office. She then moved to the private sector, where she litigated international commercial matters at Pavia & Harcourt. She rose to become a partner in the firm. In 1991, President George H.W. Bush nominated Justice Sotomayor to the U.S. District Court, Southern District of New York, and she served in that role from 1992 to 1998. She went on to serve as a judge on the United States Court of Appeals for the Second Circuit from 1998 to 2009. In May 2009, President Barack Obama nominated her as an Associate Justice of the Supreme Court, and she assumed the role on August 8, 2009. "Many of our students here at UTSA are the first in their families to attend college, just like Justice Sotomayor,” said Lisa Buentello, director of the UTSA Institute for Law and Public Affairs. “Her visit provides a chance for students to hear from someone who came from modest socioeconomic circumstances and has reached the very top of her profession through hard work and determination." Justice Sotomayor is the Supreme Court’s third female justice and the first justice of Hispanic heritage. She is the author of My Beloved World, a memoir about her childhood, education and early professional life. Justice Sotomayor’s visit is open to all UTSA students, faculty and staff. Seats in the Retama Auditorium are available on a first-come, first-served basis. Doors will open at 9:00 a.m. Bags and signs will not be allowed in the auditorium. Lockers are available for rent in the Roadrunner Express (on the Paseo) for individuals who need to stow their personal belongings. All attendees are asked to refrain from taking photos during the event, or recording Justice Sotomayor’s talk. Overflow viewing for Justice Sotomayor’s talk will be available in the Student Union Denman Room (UC 2.02.28). The talk will also be simulcast to the Aula Canaria Lecture Hall (BVB 1.328) at the Downtown Campus. Read President Eighmy’s reflections on Justice Sotomayor’s visit. Learn more about Justice Sotomayor's visit.